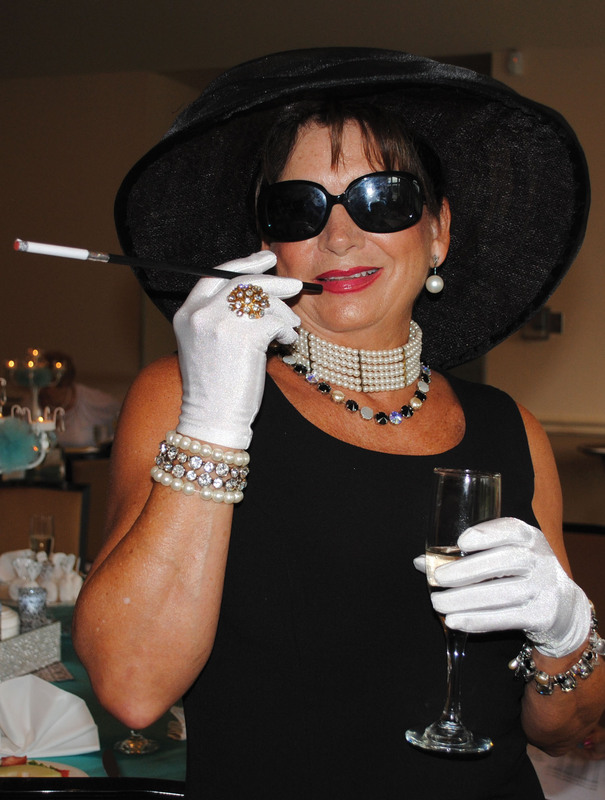 Well, dahling, come and join us, Kathleen Courville says while offering a welcoming smile to Assistance League members arriving for “Breakfast at Tiffany’s” at Bay Oaks Country Club. Ladies in little black dresses, white gloves and hats combined with little blue Tiffany boxes, and dainty flowers and desserts everywhere you looked – all of which added up to a great morning for some of the hardest working volunteers in our community. A number won awards with Carol Latimer the recipient of the Sue Holstein Award and Kim Barker taking home the Sue Brady Award and also winning an ABCD Award along with Katy Bastedo and Valerie Piercy. The Glass Slipper Award went to the St. Bernadette Catholic Church Christian Action Committee. New Assistance League officers get together for a photo op as a new year begins. 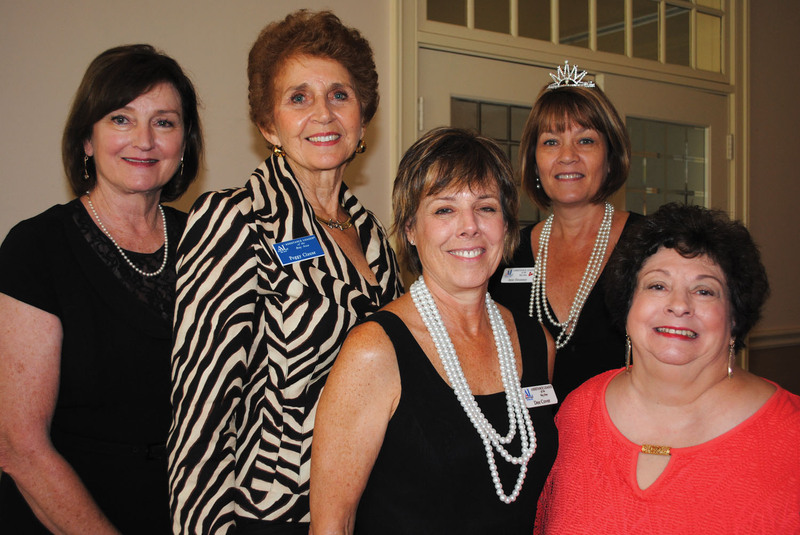 They are, from left, Secretary Ginger Darnell, President Peggy Clause, President-elect Dee Cover, Treasurer Jane Sweeney and Parliamentarian Sharon Dillard. Outgoing President Brunella Altemus used candy bars and some well-chosen words to introduce and install each new officer for 2015-16. 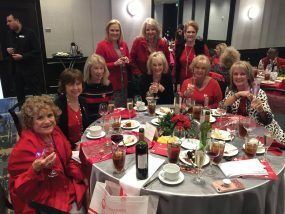 They are President Peggy Clause, President-elect Dee Cover, Vice Presidents Ann Marie Doolin, Sara Foulds, Carol Latimer and Gail Ashby, Secretary Ginger Darnell¸Treasurer Jane Sweeney and Parliamentarian Sharon Dillard. Lisa Holbrook was elected Assisteens coordinator, Arlis Miles as education chairman, Ronda Wegman as marketing chairman and Ann Hammond as strategic planning chairman. All are looking forward to another busy, busy year of helping the not-so-fortunate in our Bay Area community. 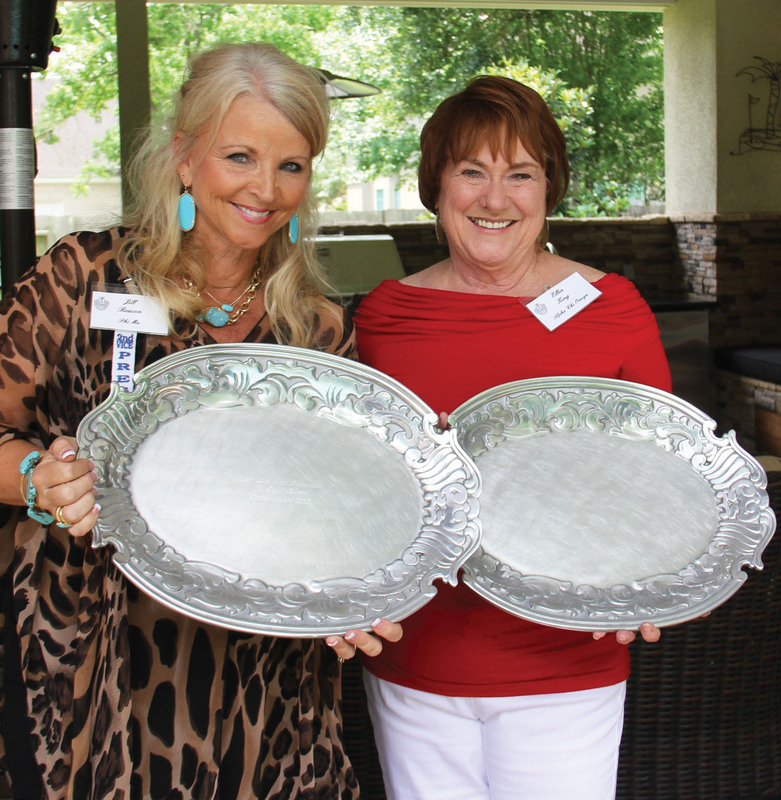 Citation Award winners Jill Reason, left, and Ellen King wear big smiles after receiving their Clear Lake Panhellenic awards at this year’s May luncheon. A FEW DAYS later, Clear Lake Area Panhellenic was also busy preparing for the coming year and awarding scholarships to some deserving area high school graduates. Kay Lee Benoit is Panhellenic’s new president, serving with First Vice President Jill Reason, Second Vice President Ellen King, Treasurer Michelle Richardson, Secretary Cheryl Williams, Jo Cat Bruce, Corporation, and Parliamentarian Kim Barker. Some of the biggest smiles of the day were worn by Ellen King and Jill Reason, both winners of the Citation Award. Along with the winners of $8,000 college scholarships — Natalie Barringer, Camille Camavata, Megan Conley, Michelle Tran and Alice Yau. A distinguished panel of astronauts shared stories about their time in space at Space Center Houston’s inaugural Galaxy Gala. The panel included, from left, astronaut Mark Kelly, former astronaut and now director of Johnson Space Center Ellen Ochoa, and astronaut Gene Cernan, who was the last man to walk on the moon. Former CNN anchor Miles O’Brien, right, was master of ceremonies and led the panel discussion. 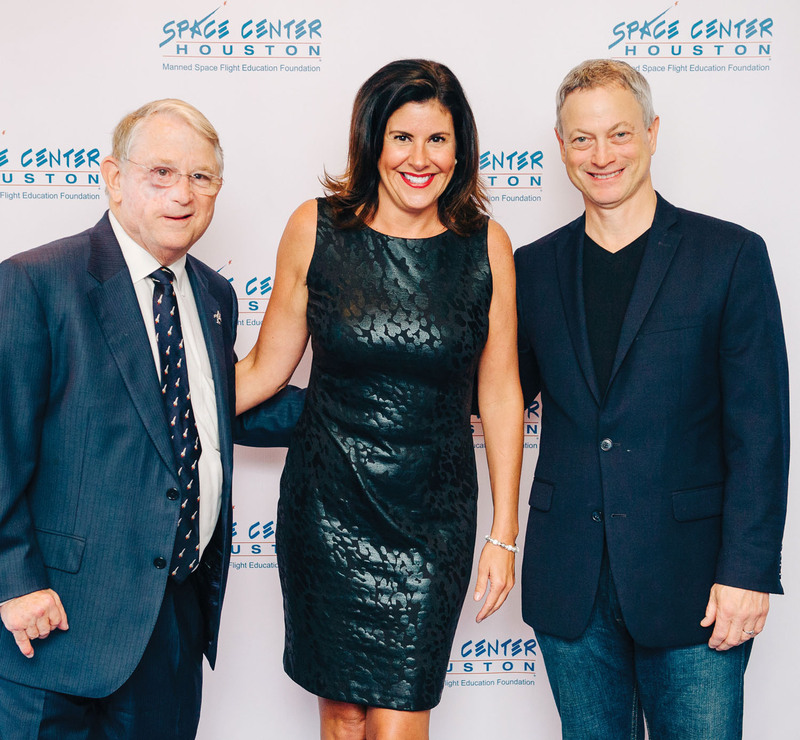 SPACE CENTER Houston’s hugely successful Galaxy Gala raised more than $1 million for the Manned Space Flight Education Foundation with Alice and Keith Mosing chairing the inaugural event. Developer Fred Griffin. left, a Manned Space Flight Education Foundation board member, and his assistant, Heather Waters, meet award-winning actor Gary Sinise at Space Center Houston’s inaugural Galaxy Gala. The pre-gala area showed historic films about the space program and displayed artifacts from Space Center Houston, an educationally focused, nonprofit space museum. Included in the exhibit were space suits, items brought back from several space missions and the presidential podium from which John Kennedy made his historic speech announcing the goal of landing a man on the moon. As guests entered the main dining area, huge screens from corner to corner gave them the sensation of floating in zero gravity. Countdown to start the evening filled the room with the roar of the blast off from a rocket launch. Sending everyone into orbit, a message from astronaut Terry Virts Jr., currently aboard the International Space Station, greeted the 700 guests. A special treat was Gena and Chuck Norris’ introduction of the gala co-chairs. 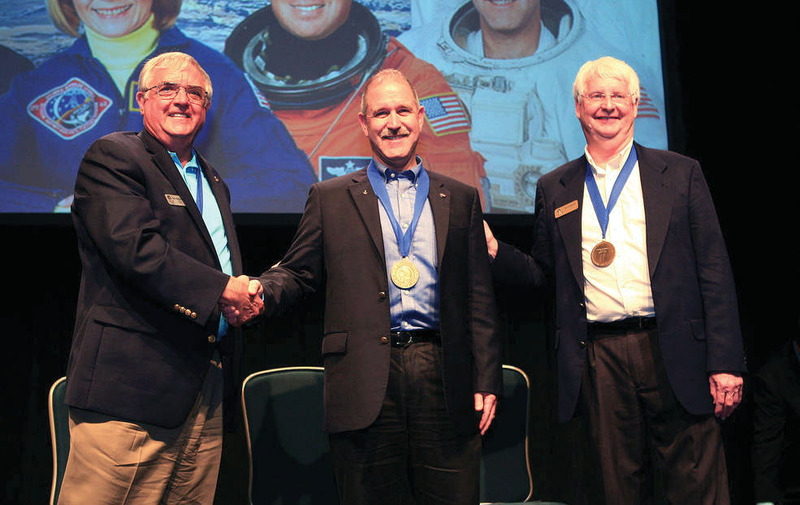 NASA Associate Administrator for and astronaut John Grunsfeld, center, is inducted into the U.S. Astronaut Hall of Fame at Kennedy Space Center in Florida. Shaking his hand is Dan Brandenstein, chairman of the board of directors for the Astronaut Scholarship Foundation, as former NASA astronaut Steve Hawley looks on. President and CEO of Space Center Houston Richard Allen Jr. applauded the leadership for the evening and the impact the funds will have on the nonprofit’s largest and most ambitious exhibit ever built. Opening later this year, the new exhibit, “Independence Plaza,” will feature a high-fidelity space shuttle replica, the Independence, mounted on the historic NASA 905 shuttle carrier aircraft. Only at Space Center Houston will visitors be able to go inside both the shuttle and the airplane. Most importantly, the shuttle complex and surrounding exhibits will expand and enhance Space Center Houston’s award-winning educational programs that motivate students to pursue careers in the fields of science, technology, engineering and math. The evening featured a top-flight keynote panel including astronaut Ellen Ochoa, the first Hispanic woman to go into space and director of NASA’s Johnson Space Center; astronaut Gene Cernan, who flew three historic space missions and was the last man to walk on the moon; and astronaut Mark Kelly, shuttle commander and husband of former U.S. Rep. Gabby Giffords of Arizona. 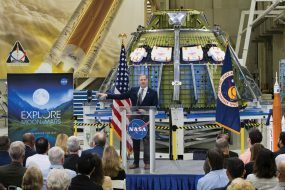 Space Center Houston President and CEO Richard Allen Jr. applauded the supporters and donors who helped raised more than $1 million for the new exhibit, “Independence Plaza,” opening later this year. Award-winning science journalist and former CNN correspondent and anchor Miles O’Brien was master of ceremonies and led the panel discussion. The audience gave a standing ovation to these distinguished speakers. Guests filled the dance floor and grooved under the stars to the sounds of the Lt. Dan Band led by award-winning actor Gary Sinise, who starred in the film “Apollo 13.” People stood in front of the stage and sang while cell phone cameras flashed throughout the night to capture the fun. Star-studded guests included Jo Lynn and Gregg Falgout, Susie and Pat Cunningham, Betsy and Fred Griffin, Kim and Dan Tutcher, Jeanne and Richard Filip, Martha and James Madget, Paula McCann Harris, Cyndy and Thomas Roberts, Leslie and Adam Schneider, Mo and Ric Campo, Bobbie and John Nau, John Poindexter, Winell Herron, Ileana and Michael Trevino, Debbie and John Daugherty, Yvonne and Walter Johnson, Trini Mendenhall and Kyla and Ron Kapche.